Catherine, divorced, mother of grown children, daughter of a woman whose dementia has taken her away already, is looking for new start on life when she sells her home in England and buys a home in the Cevennes mountains of France. She's chosen a place she loved visiting as a child, but life as an adult, trying to set up a business in a small town when you're definitely the outsider, is not nearly as idyllic as Catherine had imagined. The rains, the old buildings, the red tape - it all endeavors to wear a girl down. But Catherine's determined to make a go of it. Slowly she wins over the locals, begins to build herself a business and even meets an man (although he may be the biggest puzzle she has to solve). Her business begins to grow, her garden thrives and even the bees she's been given as a gift begin producing. But just when Catherine begins to feel that she's finally at home, bureaucracy flares its ugly head, her sister's visit exposes a new problem and a terrible loss makes Catherine rethink all of the plans she's made. Rosy Thornton teaches law at the University of Cambridge but this lady knows how to write a beautiful story. 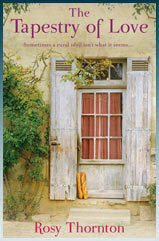 the tapestries that Catherine creates, the Cevennes mountain countryside, an intimate country life - Thornton makes them all as important to the story as the romantic love that can't seem to get off the ground between Catherine and Patrick Castagnol, one of her closest neighbors who remains a mystery. Thornton sent me this book for review a year ago; I'm sorry to have taken so long to read it. It was a lovely book to read the week of Valentine's Day! This book was a little slow for me and I didn't like the sister or Patrick for starting a relationship with the sister, so it wasn't my favorite of her books! I enjoyed this book, too. Just beautiful! I loved this book as well, but was kind of mad at Patrick for a lot of the time! It was a great story though, and some of the details about the tapestries were wonderful! I am so glad that you loved it and that it was such a diverting read for you. I remember this book with a lot of fondness. Lisa, I tried to read this one, but was just unable to get into it. I received it a year ago, too and thought it would be perfect for the Paris in July challenge, but that didn't work out. After reading your post, I'm going to give it another shot - I'm thinking I wasn't in the right frame of mind to read it, because you make it sound so good. Thanks! This book hit me at the right time and the right mood; I loved it. And yes, Patrick was not the shiny prince and the sister could have made better choices but I loved this story. I recently purchased Hearts and MInds and am looking forward to more of Thornton's writing. I glad to see you enjoyed this book. It's been sitting too long on my shelf, too, so I hope to read it soon! I loved this one!! I thought the whole story worked and I could imagine these characters interacting!